Perhaps the most famous of Weston’s photographs is Pepper 30. I never thought of this as a macro image, but Edward used mostly large format view cameras (4×5 and 8×10 inch negatives) and made only contact prints (no enlargement). Given that Pepper 30 is an 8×10 print, it is likely that this photograph is approximately a 2:1 macro image. Below is the famous photograph and my homage to Weston’s work. Using MIGHTYmacro‘s modern-day macro imaging system, I am able to make this image at 139 megapixels; if printed at 300dpi the image would be 37.8″ x 40.9″. The pepper I imaged is actually only 1 1.5 inches tall! You can interact with my image and zoom in to see lots of details. Kim points out that his grandfather’s biggest challenge was depth of field, or trying to get all of the pepper in focus. As the camera lens get closer to the subject the amount of that subject that is in focus gets smaller and smaller. This is something that we deal with every day at MIGHTYmacro as we make extreme macro images for museums, science centres, art galleries, scientists and educators. One way to increase the depth of field is to make the size of the lens opening smaller, which lets in less light. This was the only option available at Weston’s time, but the smallest setting (f64) was not enough to get the focus for Pepper 30, so he built own custom lens stops. The one used to make this famous image was approximately equivalent to f240. Today at MIGHTYmacro, we use focus stacking to overcome the depth of field problem. Focus stacking combines multiple pictures at different focus points using software to select only the parts of each image that are in focus. Every photograph comes down to four key components; content, composition, exposure and lighting. With macro photography, lighting has some unique challenges. 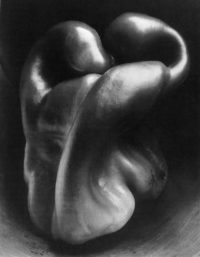 Edward Weston was famous for using natural light and that is how he lit his pepper images. With the very small lens opening he needed to achieve focus, he would need a very long exposure. In the case of Pepper 30 it is estimated that one single exposure was four to six hours! In my work, I use special telecentric lenses to allow me to combine thousands of images into one. These lenses, like Weston’s, let in a very restricted amount of light. If each photograph took us four to six hours, there is no way I could make the number of images needed for our clients. Fortunately I have the advantage of modern flashes allowing me to put the light where I need it and to shoot quickly. I am fortunate to have the benefit of modern technology to help me make images that are compelling and informative. Still, no technology can replace the unique vision and craft of masters like Edward Weston. I can’t help but wonder what Weston would have done with the technology we have today. Maybe he would have done something like this backlit pepper.